“Ronald Dethlefson is retired as a full professor with the Communications Department at Bakersfield College in California. 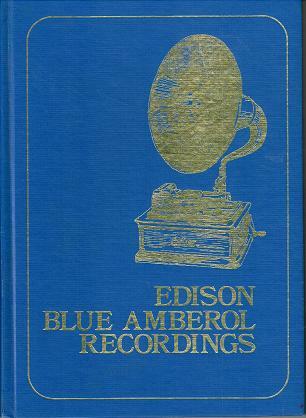 He has collected early records and phonographs since 1953 and began writing about Edison records and phonographs in 1980. In the succeeding decades, he's collaborated with George Copeland, a scholarly collector of popular and operatic recordings living in St. Louis; written a monthly column for IN THE GROOVE: a publication of the Michigan Antique Phonograph Society; been quoted extensively in the Los Angeles Times and online; and continues as a consultant and volunteer at The Henry Ford Museum in Dearborn, Michigan. 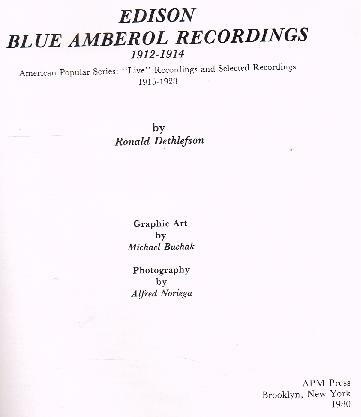 Dethlefson's major publications include Edison Blue Amberol Recordings (APM Press, 1980); Edison Blue Amberol Recordings: 1912-1914: American popular series, "live" recordings and selected recordings 1915-1928 (APM Press, 1980). In 2012, the Association for Recorded Sound Collections (ARSC) presented Ron with its Lifetime Achievement Award. 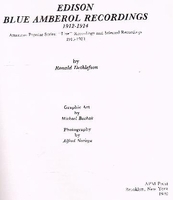 ARSC recognizes outstanding published research in the field of recorded sound, encourages high standards, promotes awareness of superior contributions, and presents this annual award to an individual in recognition of his or her life's work in published recorded sound research."